***Makes 8 servings. Keep in the refrigerator. These also make a great back-up breakfast during the week if you’re in a rush as well as a great snack alternative. Directions: Pre-heat oven to 350°F, and lightly grease 2 muffin tins with coconut oil. In a med sauté pan, heat coconut oil over and sauté onions for 3-4 minutes, until softened. Add pepper and sauté for another 2-3 minutes until the pepper has softened. Drain any excess oil and set aside. In a food processor, put in the zucchini and bacon, and process until finely chopped. Whisk the 12 eggs and season with pepper. Mix your zucchini & bacon mixture in with your eggs. Then, add the 4 cups of spinach to your processor to finely chop, and add these to your eggs in the bowl. Add the onion and pepper mixture to your eggs. 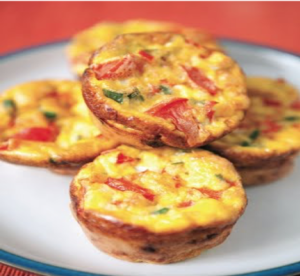 Mix the egg mixture thoroughly and fill muffin tins with ¼ cup of your mixture. Bake for 20-25 minutes or until the egg-muffins have set in the middle.